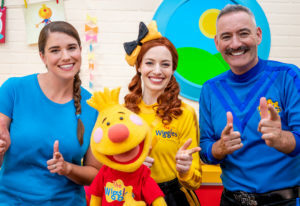 Collaborating with The Wiggles has been a huge thrill for all of us at Super Simple/Skyship Entertainment. 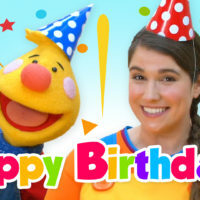 Before the first Super Simple Song was ever created, The Wiggles had already been entertaining and educating kids all over the world for over a decade. We always admired their songwriting, their talent as a band, the way that their early education backgrounds informed their songs, and the respect with which they treat children and families. 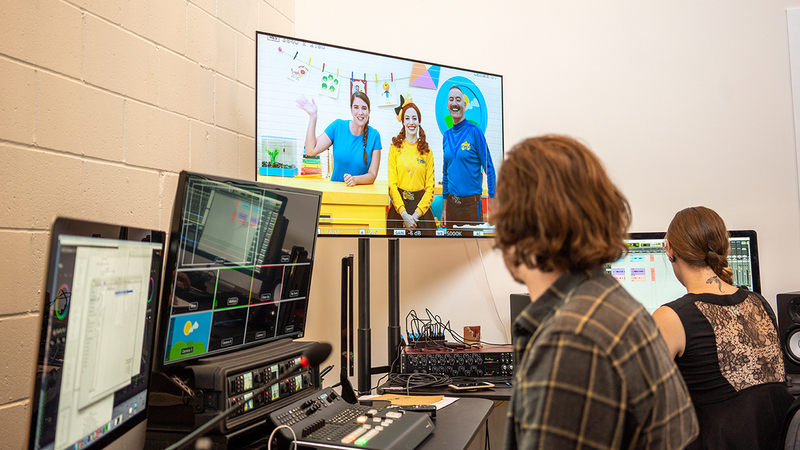 Here are a few things we learned from working with The Wiggles’ team. 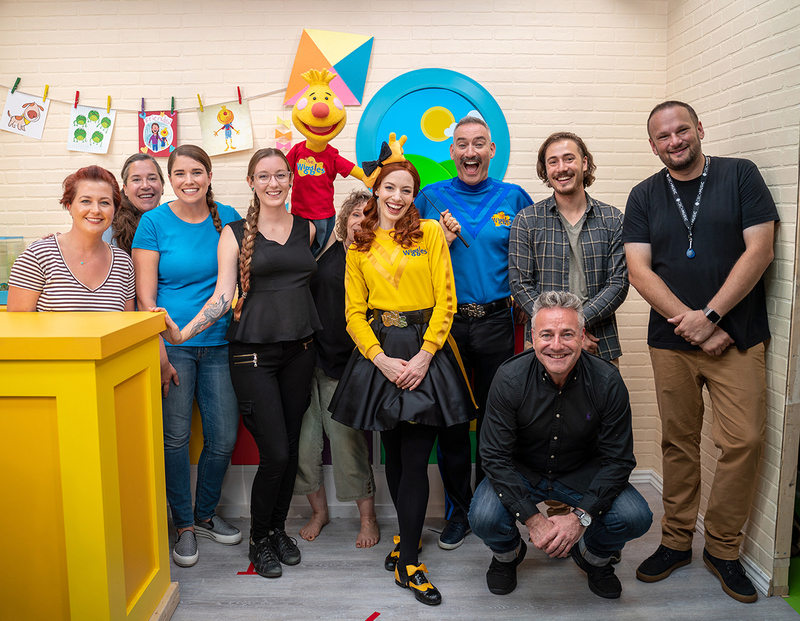 From our first meeting, every person from The Wiggles’ organization we’ve met with has been so nice and easy to work with. From the band themselves, to management, to their social media team…the whole crew acts as a family and have treated us like old friends. The Wiggles are incredibly busy, touring the world and producing new songs and shows and videos. They are working all the time but have always been so generous with their time with us, and every interaction has been a pleasure. You can see why they’ve been able to maintain such a great connection with their fans. Being kind is part of their team culture. When dealing with a brand as big as The Wiggles, there is some reasonable expectation that things are going to be done their way. 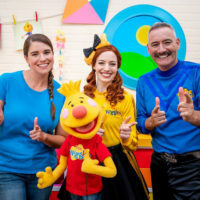 However, The Wiggles are incredibly open and flexible to trying new things, and actively encourage experimentation and thinking outside of the box. “We’d love to do a playlist together with you. What else can we do? Shoot a guest spot on Sing Along With Tobee? Sure! Have Caitie visit Emma and Lachy backstage at one of their shows? You got it! Make a brand new video together? Absolutely! Let us know what we can do to help!” That openness allows them to make connections with their fans (and make new connections) in ways that are convenient to the fans. The Wiggles really really care about what they do. Everybody on the team is all in. One thing that we’ve always loved about the Wiggles is that they stay very true to who they are. They entertain and educate children. They also happen to be top-notch musicians and performers, so parents enjoy their music as well, but it’s unapologetically for kids. We initially had scheduled a day for The Wiggles to visit and shoot an episode of Sing Along With Tobee in June of 2018, but days before the shoot Anthony had an accident in Boston that left him with a broken nose! Regardless, knowing how excited we were to work with him, he still pushed to move forward with the shoot, even with the swelling and bruising. At the end of the day, we were able to reschedule for the next time they were in town, but we didn’t forget how dedicated Anthony was to following through. On the day Anthony and Emma did visit the Sing Along With Tobee set, it was an unusually warm day in Toronto and the studio heated up. They had an incredibly busy schedule that day and had come to the studio without having slept after an incredibly long journey from Australia. But they were so gracious and generous with their time, not only during the shoot but in meeting with all of the crew and with the animators at Skyship. When you see that kind of professionalism up close, it makes it easy to understand how The Wiggles have stayed at the top of their game for over 25 years. The Wiggles clearly love what they do. It’s infectious. When Caitie visited Emma and Lachey backstage before one of their shows in Toronto, they had such a great time singing and dancing together, even though they were just about to go out onstage for an hour of singing and dancing in front of a super excited audience. Their love of music and entertaining shines through at all times. 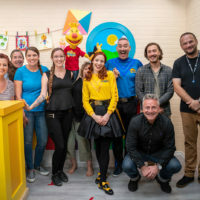 We had an amazing time working with The Wiggles for Wiggles Week. We hope you’ll subscribe to The Wiggles’ YouTube channel and catch their concert next time they are in your town. You’ll have a great time, guaranteed. Devon Thagard is co-founder of Skyship Entertainment.